An excellent review. I wish that the Islamic leaders would open up to the rest of the world instead of shunning us. Does he mention the idea of "ummah", or community? If memory serves it refers to political unions created to put Islam into practice. 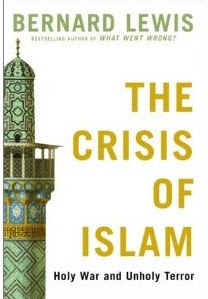 One author I've read (Karen Armstrong) attributes this to Islam's struggle to seperate mosque and state. I will admit that I am not very knowledgeable of Islam. Any suggestions for books to change that? Jamie - I would suggest that you read a book that is focused entirely on the history and practice of Islam with NO political bend to it. I actually took a class on Islam where we read some dinky little book called "Islam 101" or something, but I've found it extremely helpful to know the basics about the religion, and easier to recognize when people trying to make political arguments don't have a basic knowledge of Islam as it is. Jess, THANK YOU for this very well written, insightful review! Wonderful review Jess. It always annoy me when people go on about jihad whilst forgetting all about the crusades and the horrific things that are done by people of all religions. Thanks for this review. Definitely a book I'll avoid for now. Though I like to read both sides of a story, sometimes books like this just make me angry. Anna here- great review! The book sounds terrible!